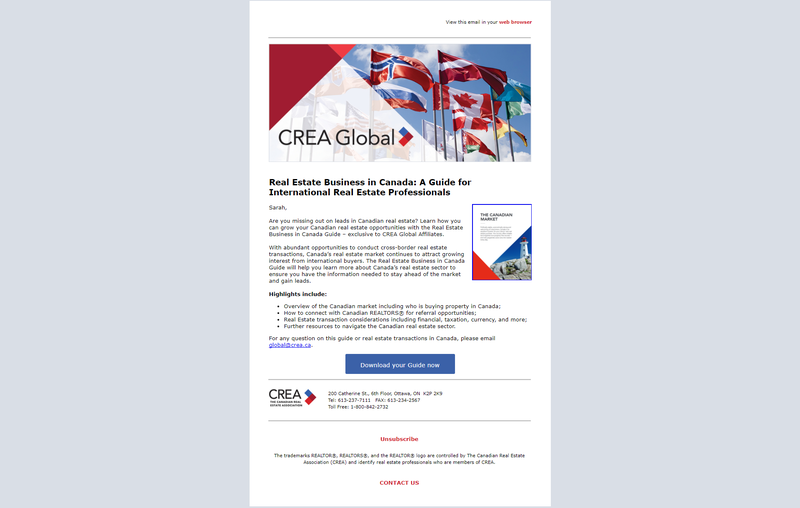 The Canadian Real Estate Association (CREA) is one of Canada’s largest single-industry trade Associations. Membership includes more than 100,000 real estate brokers, agents and salespeople, working through 100 real estate Boards and Associations across Canada. Assist with writing and designing product marketing emails and notices to REALTORS® and Brokers across Canada and the U.S. Develop campaign briefs, proposals, and track and analyze campaign data to create reports and progress. Write rich and valuable content for a variety of platforms such as emails, websites, and promotion documents. Manage and maintain accurate and complete product information on REALTOR Link®, CREA’s intranet. Issue ad buys and maintain accurate records of allocation and spending. Researched and wrote 20 + city descriptions for REALTOR.ca. Wrote and launched the CREA Global monthly email, Global View. Increased 2 Minutes to Win it contest participation by over 200% from 2016. Below are Facebook and Twitter posts promoting the value of REALTOR.ca and directs followers to the REALTOR.ca Insights report.